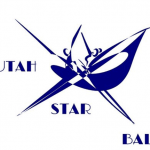 The 2018 Utah Star Ball hosted by Ballroom Utah will take place at the Ballroom Utah Dance Studio in Salt Lake on October 20, 2018. Entries are due by October 10. For more information, contact 801.916.4716, dance@ballroomutah.com, or visit the event website.